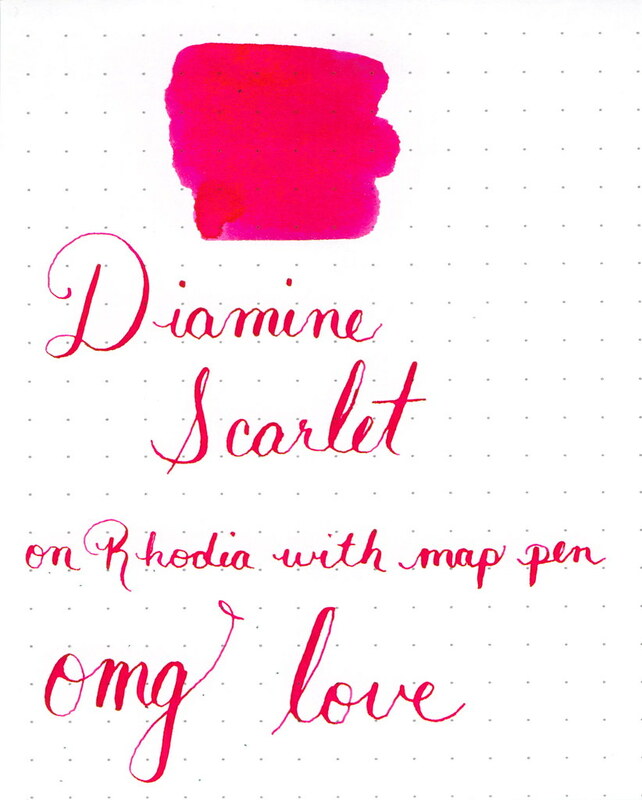 OMG OMG OMG I love this ink. 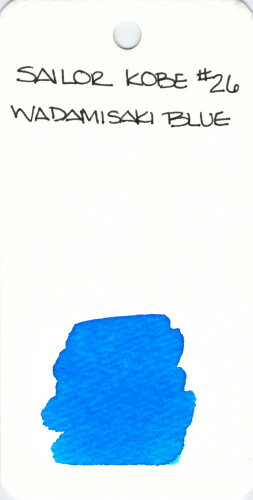 Sailor Kobe #26 Wadamisaki Blue is a terrific ink. I can’t believe I’ve never reviewed it for the blog. I know I’ve posted about it on Instagram, but it’s been so long that I can’t find it. Watch for a review soon. 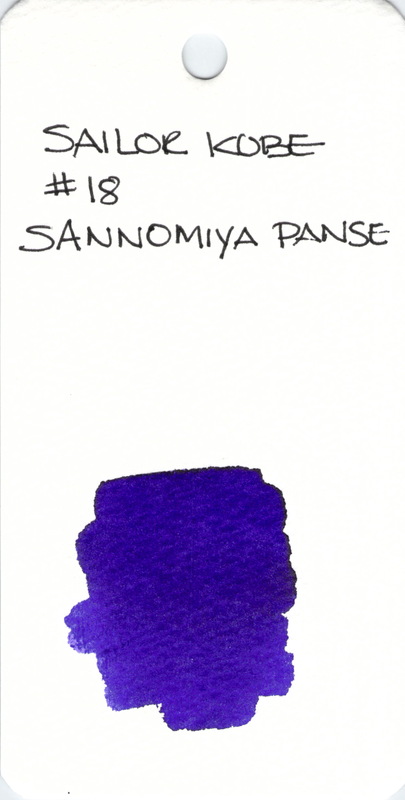 Spoiler: I love this ink. BIG LOVE. Oh, hey, this is totally how I feel about Daylight Saving Time this year. Because, seriously. This Puccini might be love! There is zero – zero – water resistance. Want to know a little secret? I love the “shreds” that tearing paper out of a notebooks leaves behind. Crazy, right? 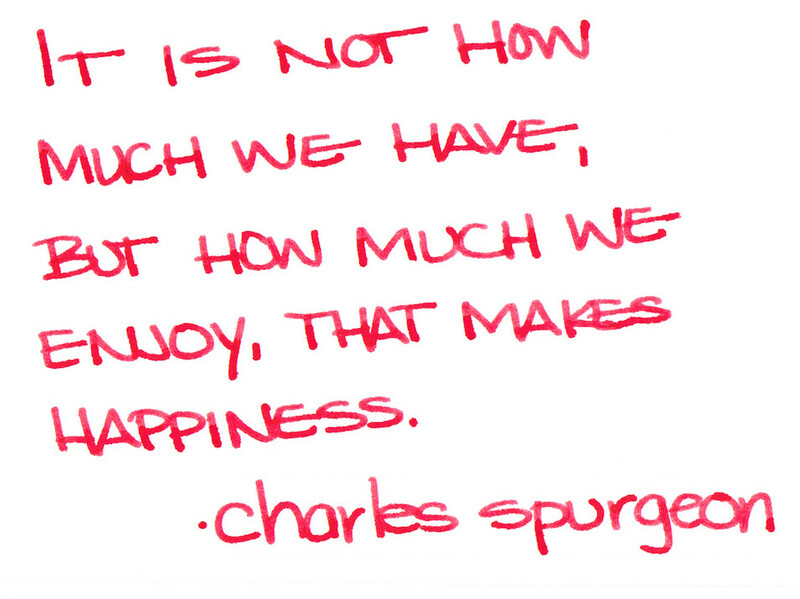 Crazy, but true. Mr. Pentulant hates them – cracks me up. 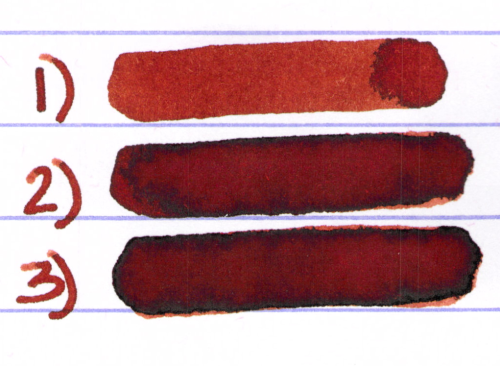 Anyway, I bought my sample from Goulet Pens and this ink has since been discontinued. I love it, but I also love Alexander Hamilton. 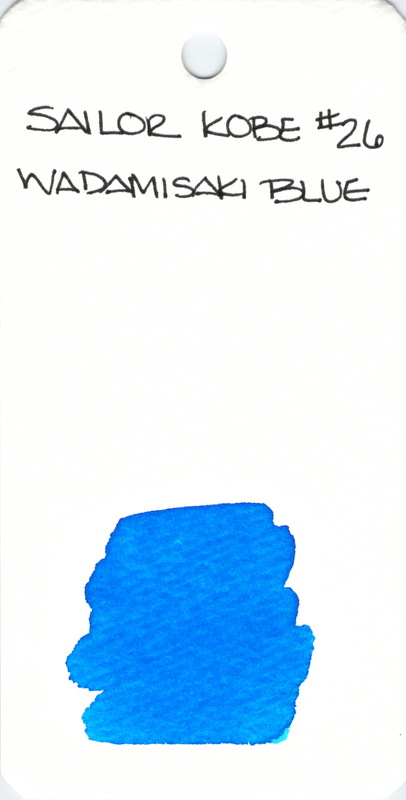 To be honest, I find myself wondering if it’s the same ink. 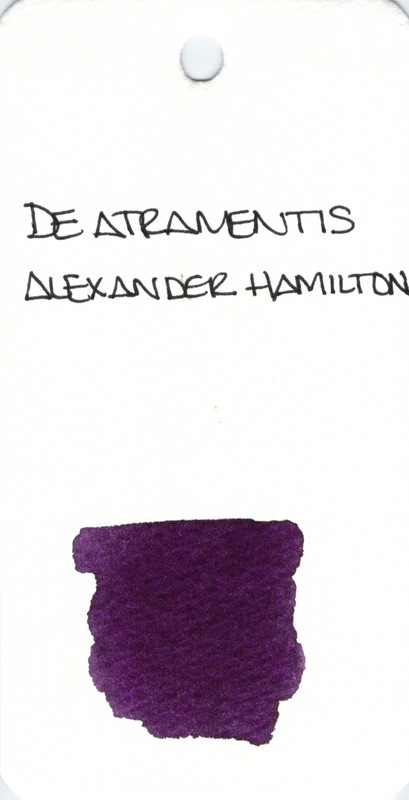 A long time ago, I asked Brian Goulet if there was a way to tell which of the various De Atramentis inks were which of the other De Atramentis inks – there’s not. So disappointing. In any event, if you love Pucccini like I do, you might take a look at Hamilton and see if you love him, too. I think you will. If you follow me on Instagram, you already know how much I love this pen. It’s big love. Major Big Love. The love I feel for this pen may rival my Montblanc Heritage 1912. It’s serious. I received this pen as a Christmas gift from Mr. Pentulant last year and I’m pretty sure I squeeeeeeeeed when I saw it. It’s a beauty. 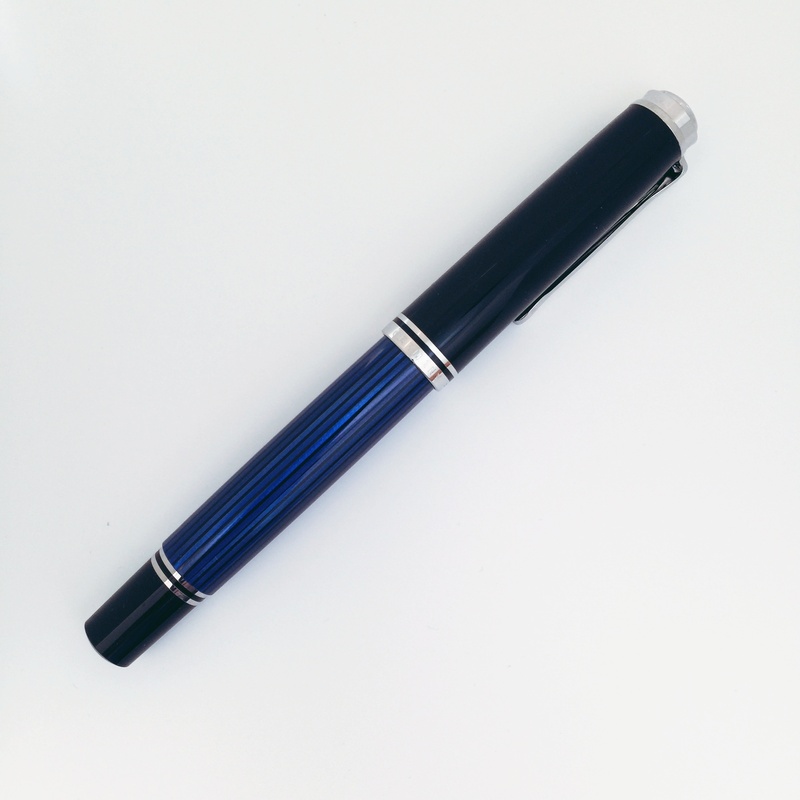 Dark blue and black stripes, shiny palladium platings, two-toned 18 carat gold nib with rhodium. More than just a pretty face, though, the Pelikan M805 is a solid and iconic pen with a long history. 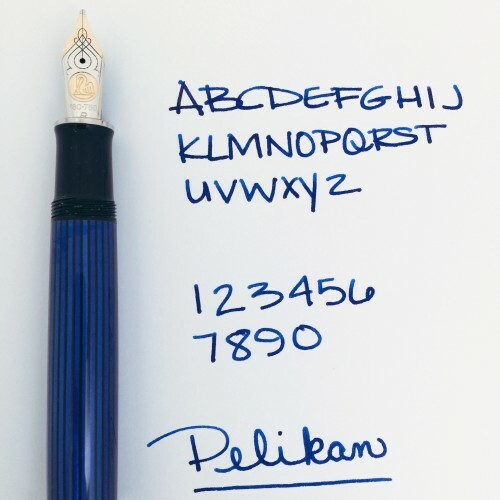 In fact, the Souveran line from Pelikan was launched in the 1950s (the green 400-size was the first). 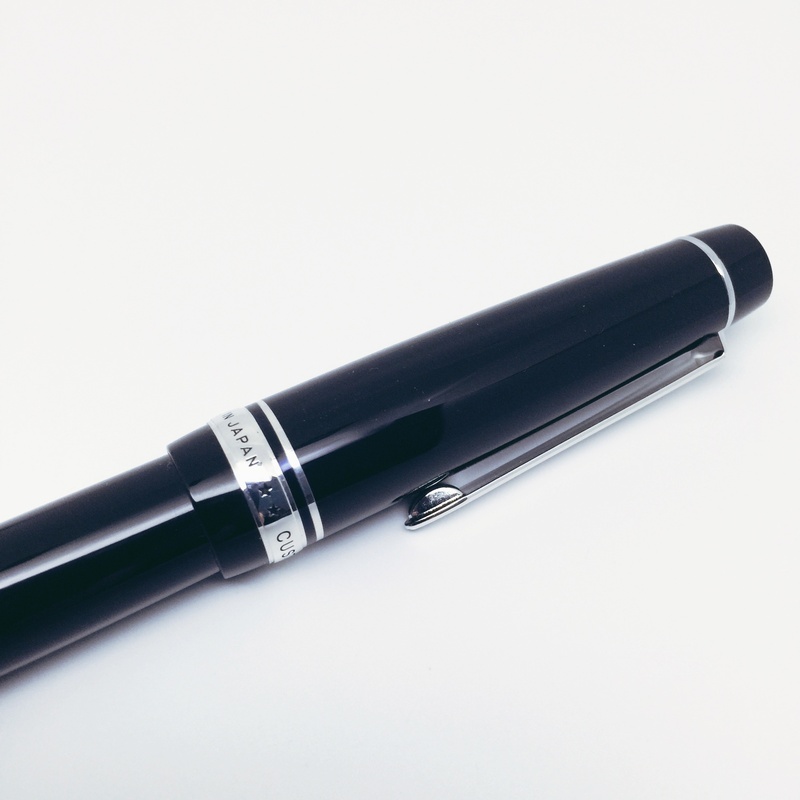 This pen uses a differential piston fill system. The one thing spins faster than the other thing (read about that here). I’m not sure if that’s why – but I can tell you the mechanism is the smoothest I have experienced. It feels like things are gliding along during the fill process. The caps screws on and can be posted. I’d say that the posting isn’t as deep as I’d like, but I feel confident that it’s not going to slip off the end. While perfect for me, I wonder if the section is long enough on this model for very large hands. 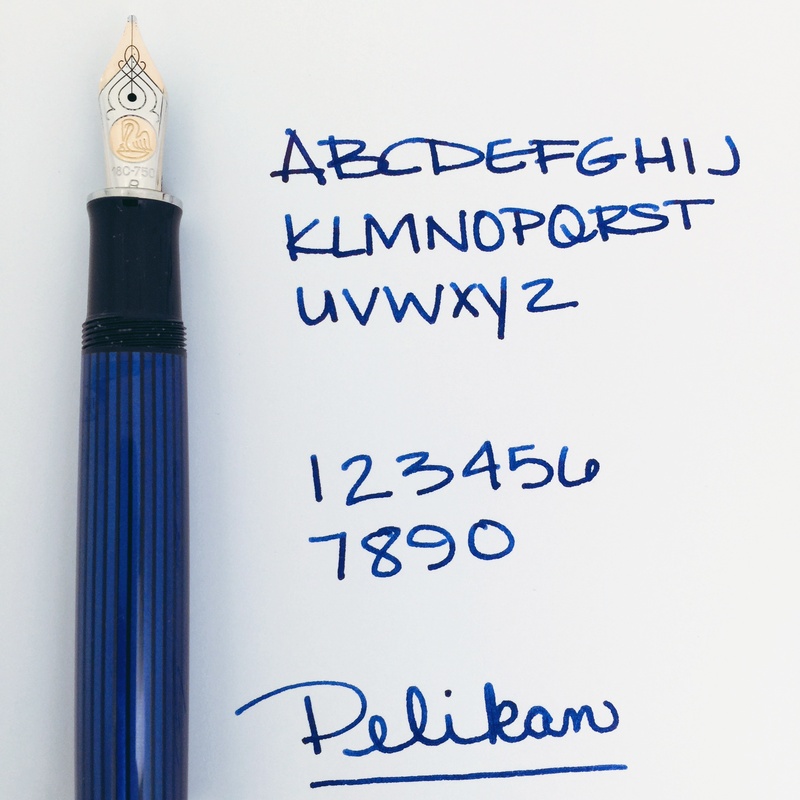 How Does The Pelikan M805 Write? Like, omg. That’s how it writes. Seriously. I am not kidding you. 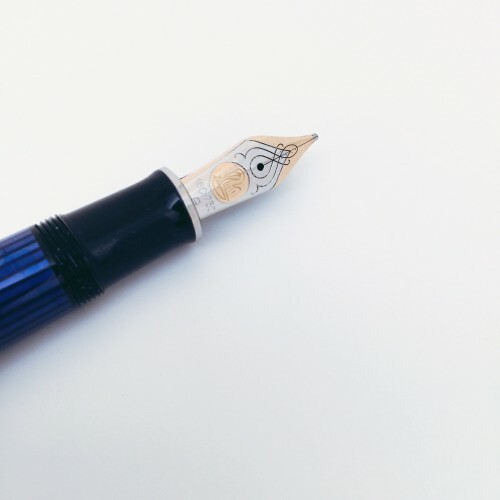 The nib is smooth without skating across the paper. I have a broad nib and it’s definitely a western broad. It’s juicy wet without laying down too much ink. 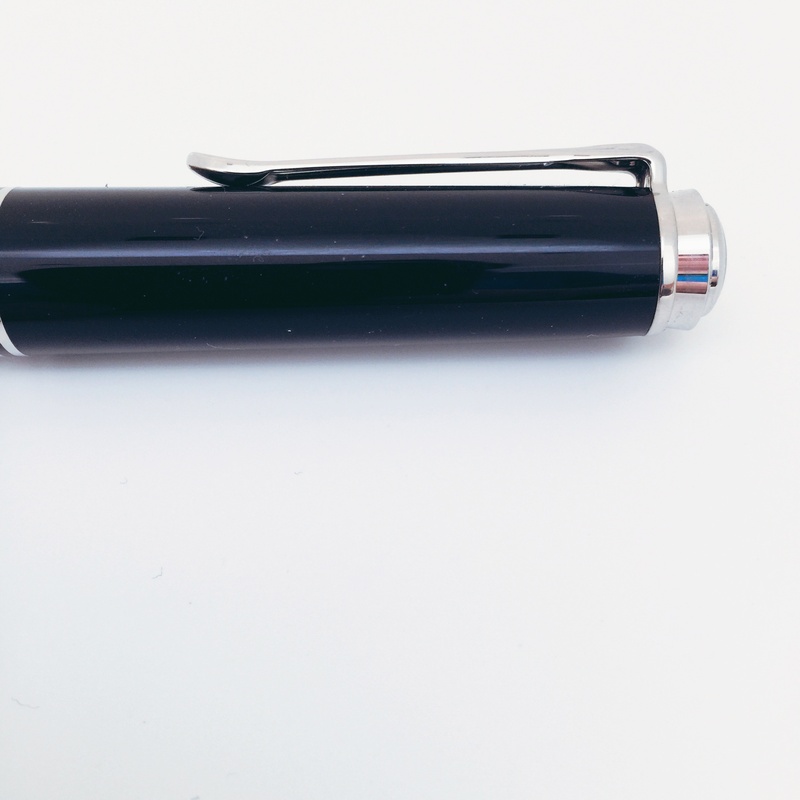 I may be crazy, but I think my handwriting is improved by this pen. 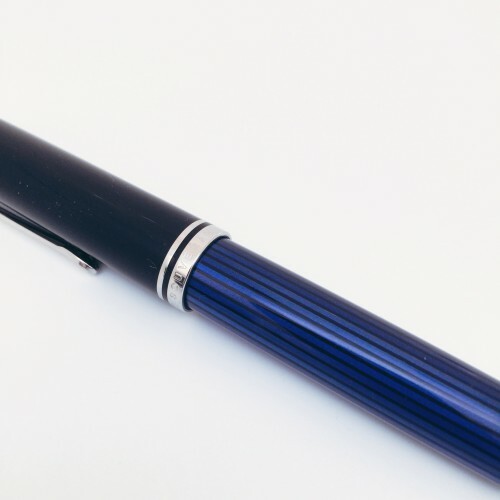 Based on my experiences, I would say that if you’re a serious pen lover and you have the budget, the Pelikan M805 should be on your wish list. I know I already have my eye on another! 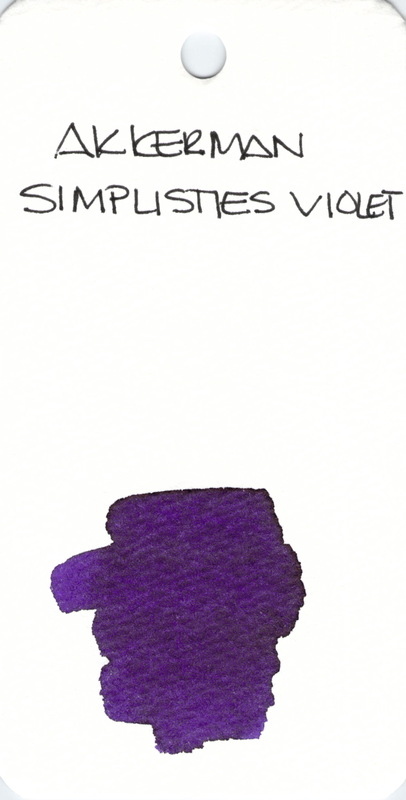 With all of the pink and red out there today, I thought I’d do something a bit different and show off a beautiful purple ink that I love – PW Akkerman’s Simplisties Violet. This is an ink that I’ve reviewed in the past and absolutely loved. The fact that the ink comes in the best bottle ever is just a bonus. 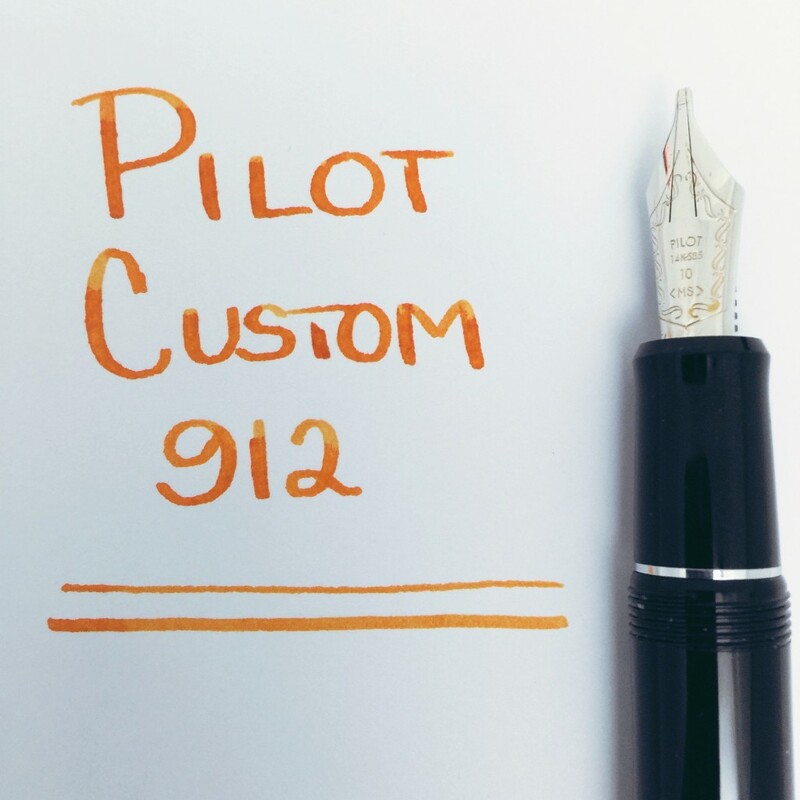 The Pilot Custom 912 is a nice looking pen with classic styling. The body is black resin and the trim is shiny and silver in color. The cap screws on and posts easily to the back of the pen. The section is a bit shorter than average and this could present an issue for people with larger hands. Fill using the included Pilot CON-70 converter or Pilot’s proprietary cartridges. The CON-70 is unique in that it is a push-button / pump converter and it holds a bunch of ink (around 1 ml). I love it, but there are varying viewpoints out there. The good news is that if a user hates it, one of the other Pilot converters can apparently be swapped in easily enough. Music nibs are sometimes referred to as trident nibs because they have three tines. 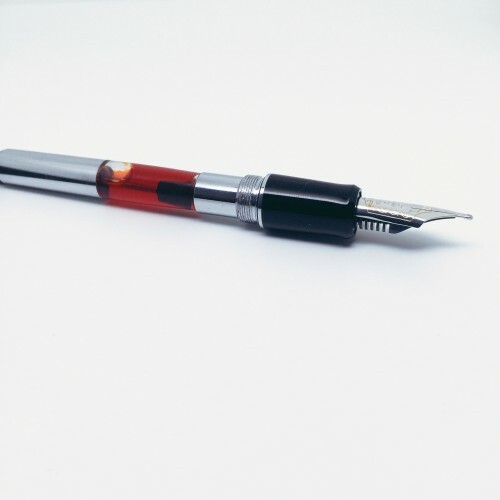 That is to say that this nib has two slits through which the ink flows. Lines drawn vertically are thicker with this kind of nib than lines horizontal lines. 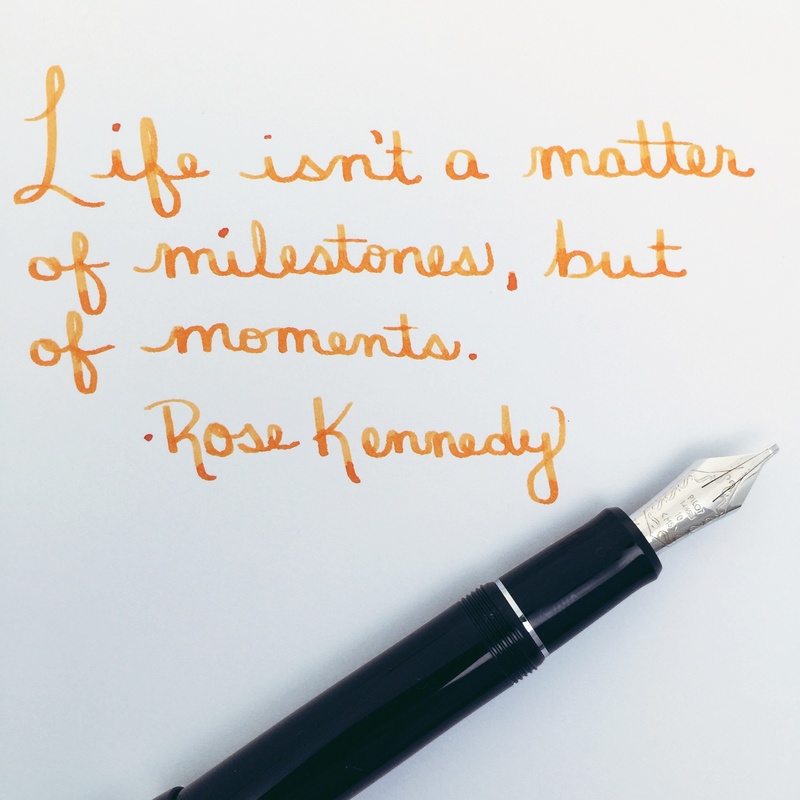 With cursive writing, the pen writes wonderfully. But with printing I’m having some hard starts on some downstrokes. Arrgh. The trouble can be seen in the image below. See where the M in “Music” and the I in “Nib” look a little off? It looks like there’s an issue with the left side of the nib. Now what? 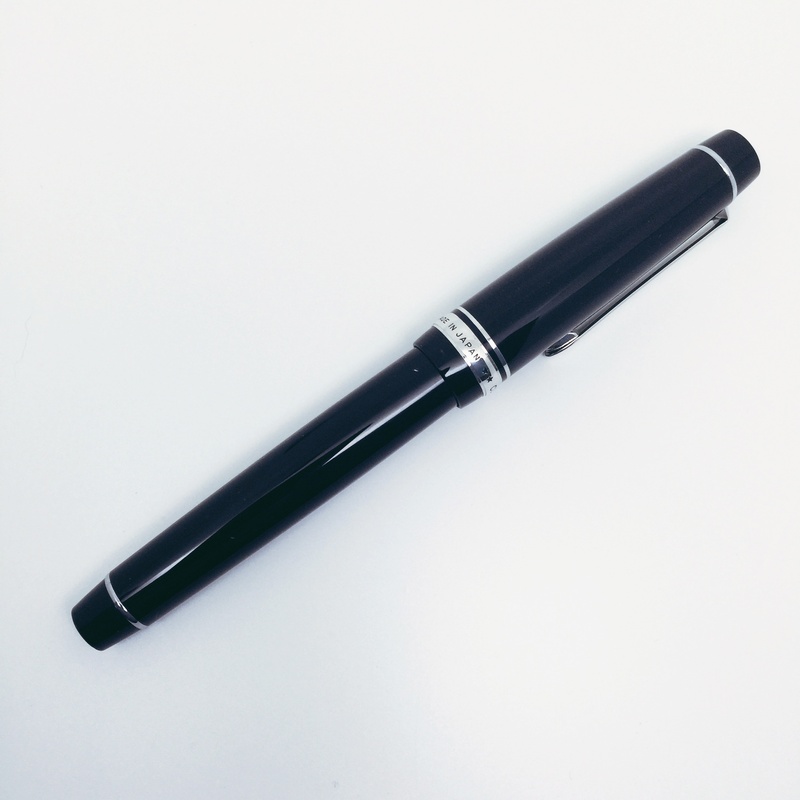 Well, I love the pen and I’m not going to return it, but I will be looking for someone to tune the nib. 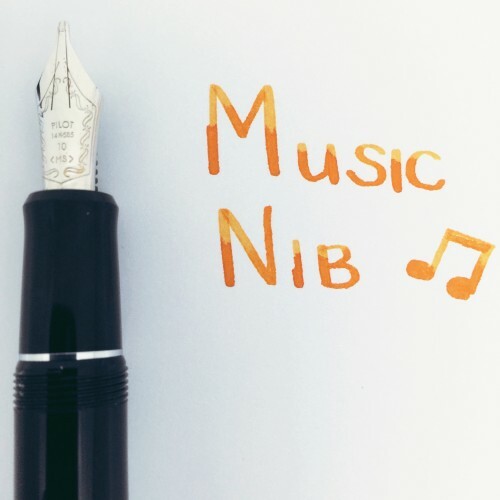 Do you know a nibmeister with expertise making music nibs sing? Also, if you have this pen, I’d love to hear what you think of it. 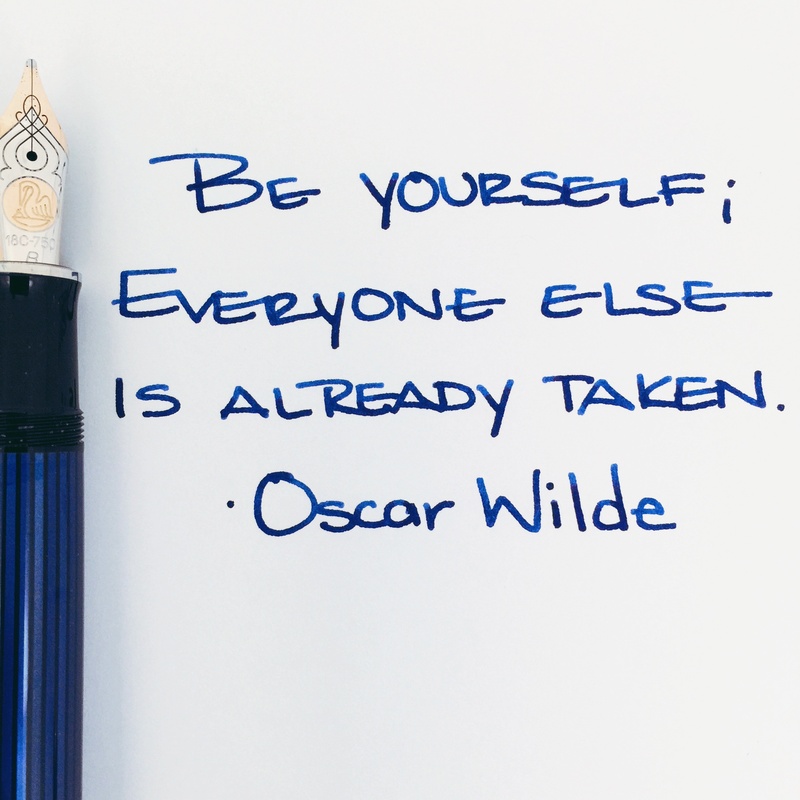 Did you get the music nib, too? Terracotta was released late last year as one of eight inks Diamine created to celebrate the 150th anniversary of the brand. Over the past couple of years, Diamine released a couple of limited edition sets of inks, but they had to be purchased as a complete set. It’s nice to see that each of the eight inks in this Anniversary Collection may be purchased separately. Here’s a picture of the arranged bottles (and swabs – always swabs!) I posted on Instagram awhile back. I love that they remind me of Trivial Pursuit wedges – collect them all! The color is a unique and pleasing brownish-reddish-orange that doesn’t remind me too much of terra-cotta pots and their traditional chalky band-aid color. Terracotta is well-saturated and it shades beautifully – just enough to give it some character. Flow is good from the pen and I’d say it’s on the wet side of average, but definitely not wet. There was no significant ghosting and no bleeding. All very good things. There are two “features” of this ink that may be a deal breaker for some people . . .
dry time is longer than average (or at least it was in my bold-nibbed pen). Even at 45 seconds, there was a little smear. I can live with both of the downsides of this ink quite easily and am finding myself using it every day for various notes. 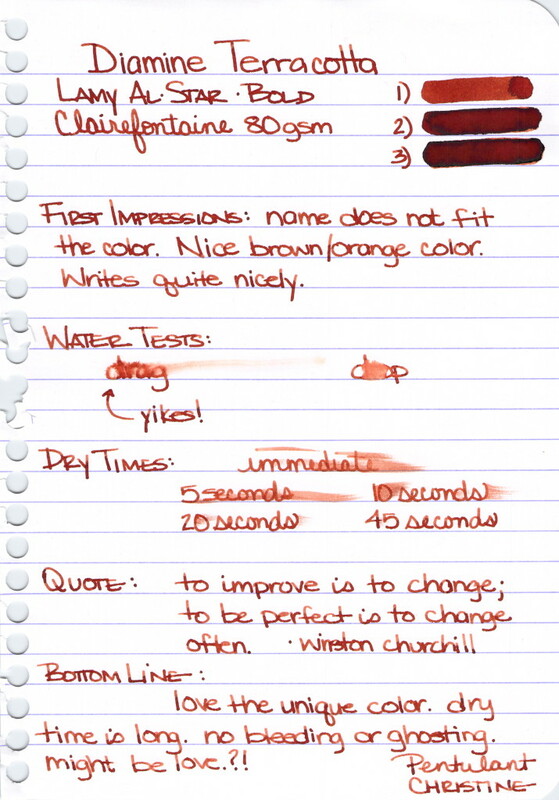 Here’s the entire handwritten review of Diamine Terracotta. If you’ve tried Terracotta, I’d love to know your thoughts. Or maybe you’ve tried another one of the Anniversary inks? OK, seriously, I love Alexander Hamilton. 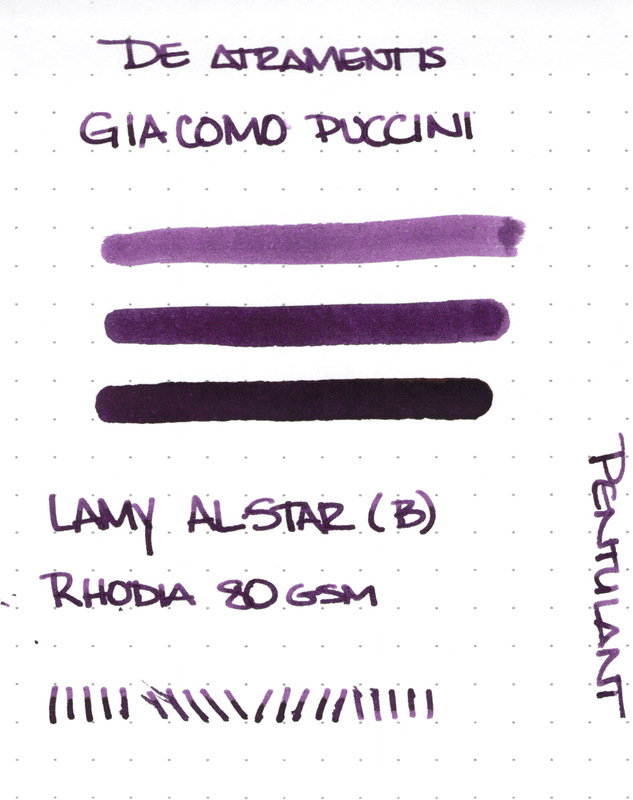 And this ink from De Atramentis isn’t bad either. Ha. This dark and dusky shade of purple really does it for me. Check out my full review and then go get yourself a bottle of this yummy yummy ink. I love this ink. The Sailor Kobe line has lots of great colors and (so far) the ones I’ve tried perform well. I got mine on eBay. If you know of other places to get the Kobe line, please leave a comment below. I found Candyology over the holidays. I don’t know if that’s a good or bad thing. Mmm…chocolate. Amazing pink-red color, great saturation. Side Note: I’m beginning to think that if I put my words in italics, it’s like whispering. And whispering is kind of like wordless, right? 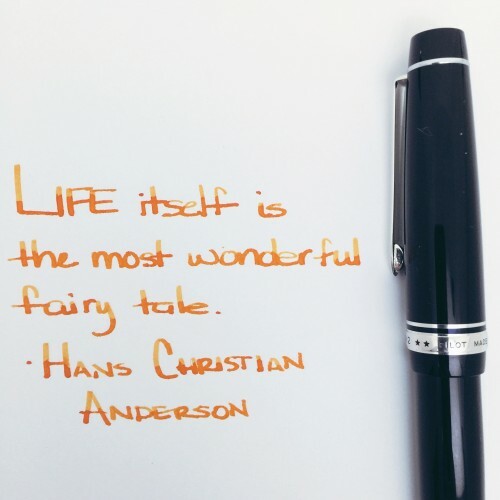 It feels like it’s been awhile since I’ve been able to say this – I LOVE this ink. 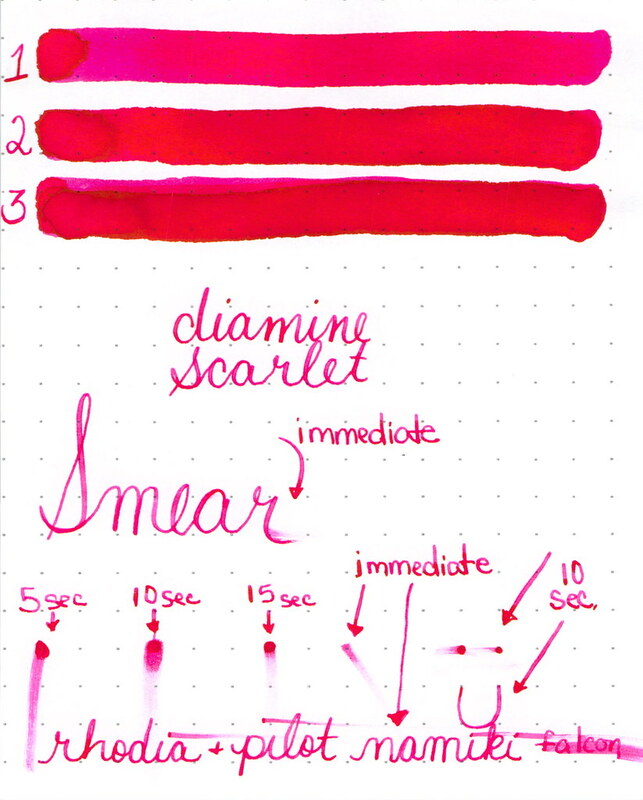 Diamine Poppy Red fountain pen ink is a pure, bright red ink with a teeny tiny bit of potential for shading. 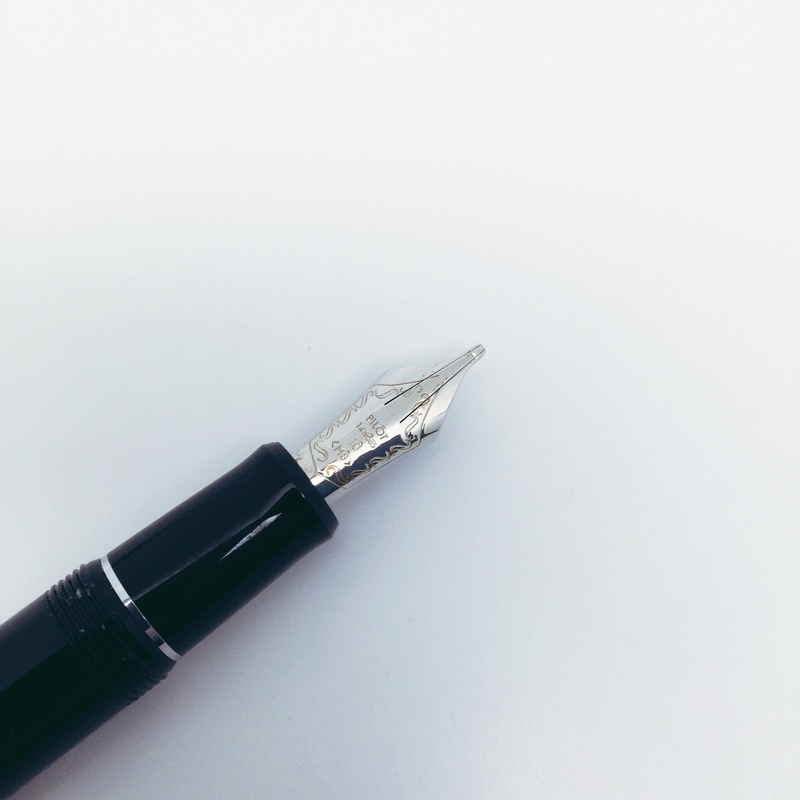 The ink dries faster than average on the page and doesn’t feel dry (nor too lubricated) in the pen. There is not much water resistance, but I didn’t expect there to be. There were no hard starts, no ghosting, no bleeding, no problems. 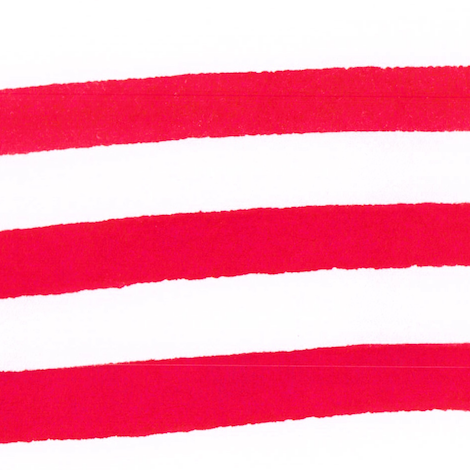 Just plain ole happy red RED saturated ink. The swabs above are 1, 2, and 3 passes with a super-soaked cotton swab. 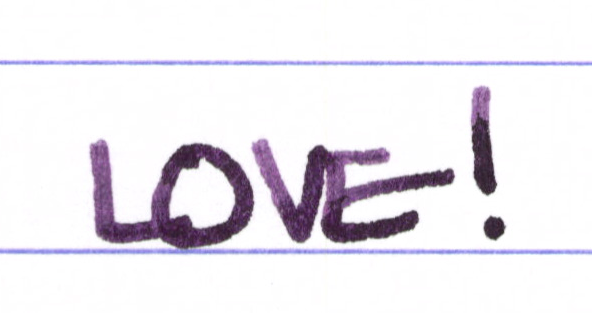 And here’s a close-up of some handwriting with it . . . 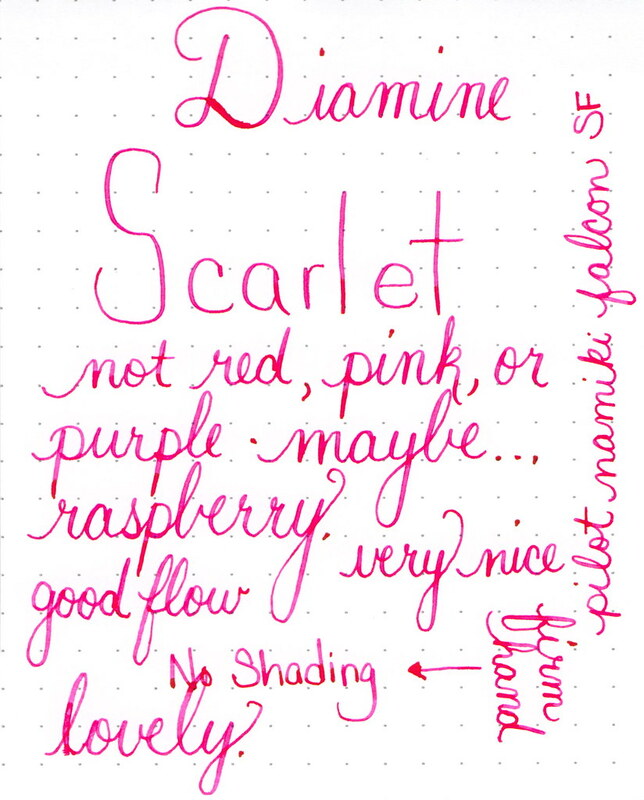 Seriously, I have nothing but good things to say about Poppy Red from Diamine. 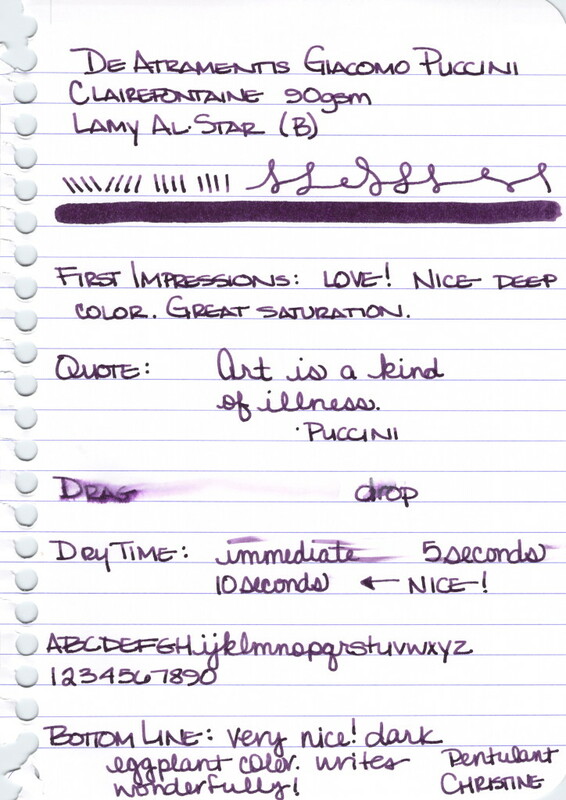 This review is from a sample I bought from Goulet Pens. I will have a full bottle of it in the very near future. Love, love, love. Here’s the full review . . .
What do you think? Love it? 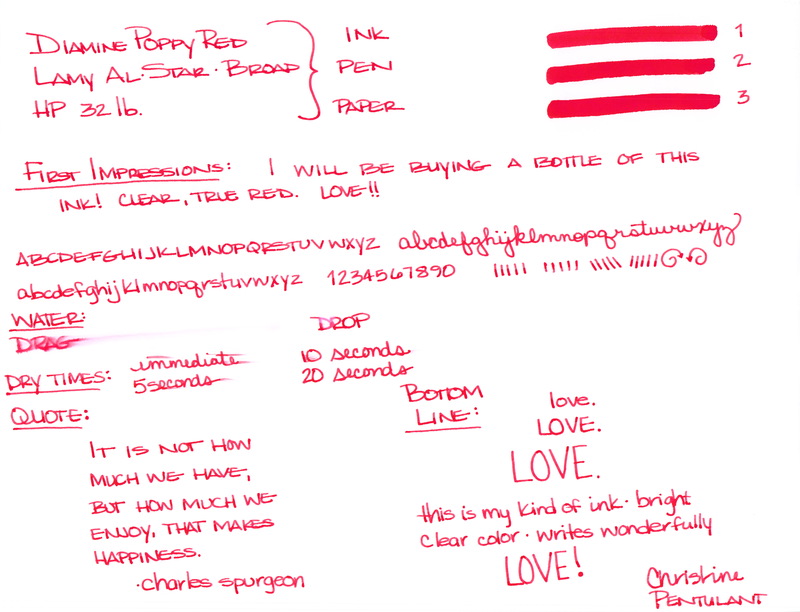 Maybe you have another go-to favorite red ink? How was your Thanksgiving? Mr. Pentulant and I were at the beach for the long weekend. We had a great time. So relaxing.